Paraglider, Wideford Hill, 9 Oct 2004. He had all his teeth in situ when he landed. No wonder he has all his teeth as he is only 2 feet off the ground ! 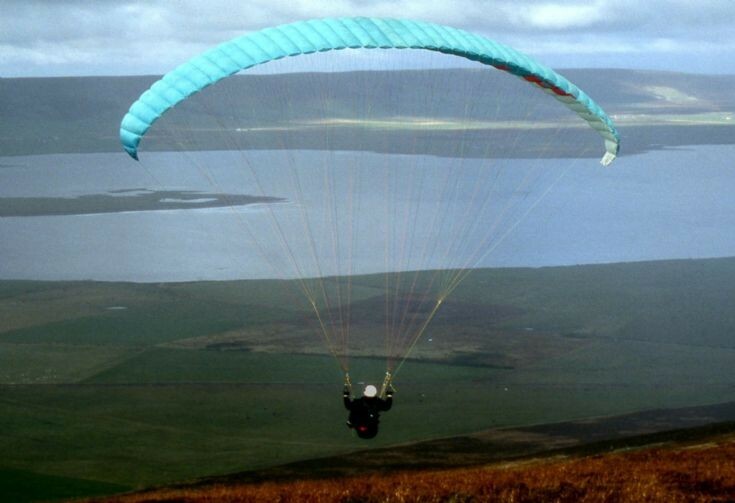 Anyone know who this is, or if anyone in Orkney has a paraglider? I chatted briefly with the guy but didn't get his name. No idea about other paraglders, sorry. I saw one over the south Mainland of Shetland on Sunday. It's me! And Tim Wright knows how to loose teeth at low level on Wideford while messing about with free flight. Do you have to be called Tim to do this sort of thing? It helps but Red Bull also as it "Gives you Wings " Don't help you with landing though ! !